Yoyo Studio Llama is a Japanese maker of ultra high-quality yo-yos in limited quantities. The Karpediem model in this exhibit is the signature yo-yo of Masaya Terasaka. Masaya was a 3A division competitor who placed 3rd in the 2004 Japan Nationals Yo-Yo Contest and placed 1st in the 2005 East Japan Yo-Yo Contest. 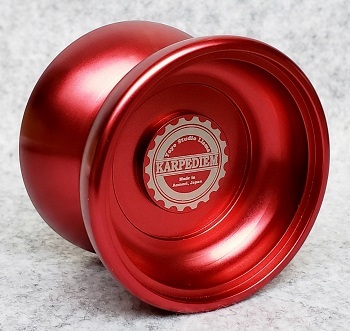 The Karpediem was designed to accept side caps from Duncan Wheel yo-yos. You can also use Duncan Mod Spacers with this yo-yo. A beautiful and balanced design. Watch Masaya in action with the Karpediem!